Not sure if anyone was watching this Cave In record last night but what in the hell happened? This thing use to go for 120+. Now 49.79? That's a joke. In my opinion this is the best album they put out. I past out about 40 minutes before it was completed. But right before I did, I decided to set my alarm because it was at 37 bucks, and even though I expected to wake up with 2 minutes left and see it above 75, I thought it was worth a look. To my surprise, the alarm goes off, I press refresh, and the thing is still at 37 bucks with 1min 52sec left! I totally freak out thinking no one is watching this thing and decide to throw a steal bid of 41 bucks in with 10 seconds left. I thought I would either win it or get beat by 60 or 70 dollars. Neither happens and someone wins it for under 50. This totally confused me, so I decided to do some research. 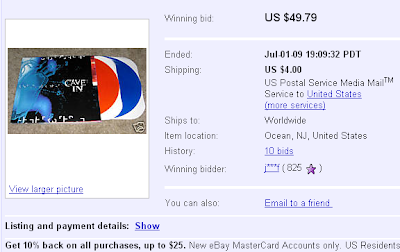 It seems that ever since March of 07 the orange/blue copy of this record hasn't broken 80 dollars. In fact, an auction ended on April 26th of this year for $34. I would keep my eyes peeled for this record in future. It might be in a slump...a very long slump, but at some point it has to pick up again. This record is just too damn good. One thing of note here, there were 10 bids and 8 different bidders, not like 2 or 3. That's something to consider. The popularity of the record isn't down, just what people want to pay for it. What's interesting is that I'm sitting here not overly bothered about how the price has dropped. I guess this is because I bought this when it came out, so I paid standard "new release" price (whatever that was back then). I just sold some stuff that went for next to nothing. Maybe all the big bidders have all gone on holiday for the summer. Who knows?